Your partner in Deaf education. Deaf teachers, doctors, lawyers, business tycoons, architects, managers, computer programmers, artists, psychologists, academics, actors and sport stars are ready to be educated. SLED works in partnership with teachers, schools, education departments, Deaf organisations, funding partners, donors, and people of good will, towards the education that Deaf learners need to fulfil their potential. There are no shortcuts. Quality learning and teaching support materials, effective teaching skills and Deaf leadership in education are key. Deaf children need your support to bring the best learning materials and teaching skills into their classrooms. Every Rand you give helps to make this possible! Since 2001 Sign Language Education and Development (SLED) has become known throughout South Africa and its neighbouring countries, as a Deaf non-profit organisation that is committed to providing the Deaf child of South Africa with an equal and democratic right to literacy, learning and access to information through the promotion of South African Sign Language (SASL). SLED’s vision is to see all of South Africa’s Deaf children achieving their full potential. 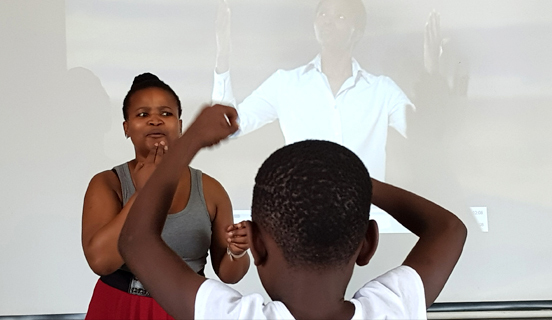 SLED’s main objective is to facilitate the Deaf child’s equal & democratic right to literacy & learning through the promotion of South African Sign Language. We have all, at some stage, noticed how an infant reacts to sound. Then in time we’ve heard them mimic what they hear. And we have marvelled at how they learn to speak. Not so for Deaf children. Deaf children react differently, mimic differently and learn differently. How does this happen? They are naturally receiving language through their eyes rather than their ears. When they are exposed to a visual (signed) language, they follow a language and cognitive development trajectory equal to their hearing peers. Deaf children watch with their eyes, and mimic what they see. The condition for a Deaf child’s fully equal development is access to sign language from birth and throughout their education. However, only about 5% of Deaf babies are born to Deaf parents and are therefore lucky to have access to sign language from the time they open their eyes. Most Deaf children grow up in hearing families, and need access to sign language as soon as possible. For this reason schools for Deaf children need to be sign language communities, where children can naturally learn and socialise in their country’s sign language. In South Africa this is South African Sign Language. We wish all our friends and supporters a good, happy and safe weekend. image credit suju on pixabay.